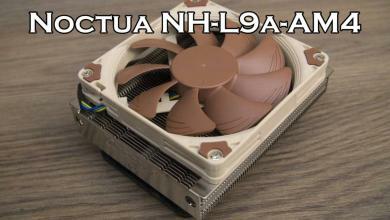 Expanding their their heatsink lineup to those looking for compact ITX solutions, Noctua announces the release of the NH-L9x65 CPU cooler which is basically a beefed up NH-L9i and NH-L9a compact CPU cooler. While the NH-L9i/L9a are only 36mm tall and compatible in very compact spaces, their performance was limited. 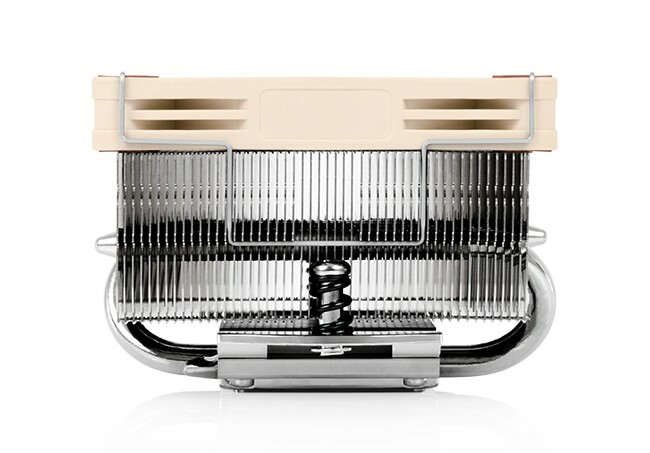 The extended 65mm tall NH-L9x65 however has much more thermal headroom, especially with two additional heatpipes, increased from two to four. 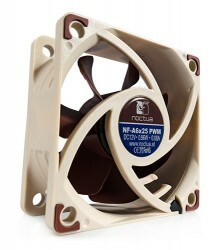 Also, Noctua is releasing the NF-A6x25 PWM fan that is capable of up to 3000 RPM or 2300 RPM with a low-noise adapter. 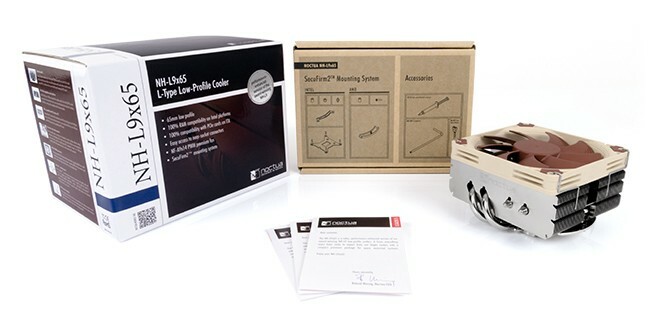 For more information, check out the official press release below from Noctua’s website. 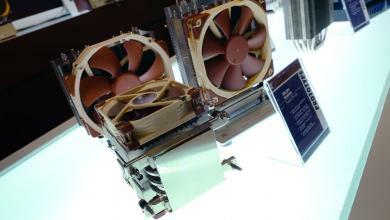 Vienna, March 11th 2015 – Continuing its recent focus on premium grade cooling components for compact systems such as ITX based gaming or Home Theater PCs, Noctua today released its new NH-L9x65 low-profile cooler and a 4-pin PWM version of its popular NF-A6x25 60mm fan. 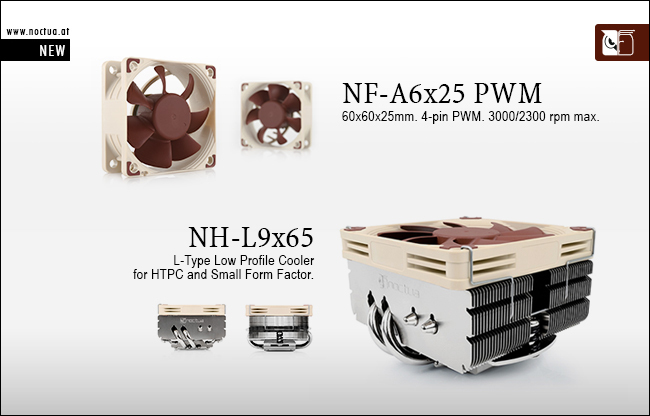 While the latter adds PWM support for automatic speed control to the proven NF-A6x25 design, the NH-L9x65 is a taller, performance-enhanced version of Noctua’s award-winning NH-L9 low-profile coolers. 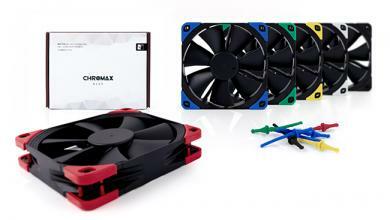 Due to its compact heatsink and the renowned 14mm thin NF-A9x14 PWM fan, the NH-L9x65 stands only 65mm tall (the same height as low-profile expansion cards), which makes it ideal for use in compact HTPCs or Small Form Factor cases that offer limited clearance for CPU coolers. 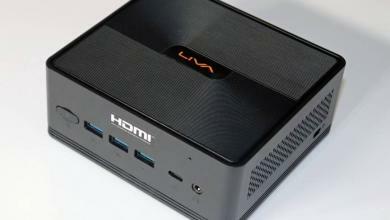 With 65 instead of 37mm height and four instead of two heatpipes, the NH-L9x65 is more powerful than its smaller siblings yet retains their 95x95mm footprint, which guarantees 100% RAM and PCIe compatibility on Intel based ITX mainboards and makes the cooler more convenient to work with as it doesn’t overhang near-socket connectors. 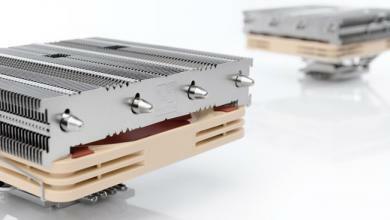 Topped off with the professional SecuFirm2™ multi-socket mounting system for Intel and AMD, Noctua’s renowned NT-H1 thermal compound and 6 years manufacturer’s warranty, the NH-L9x65 fuses everything users have come to expect from Noctua’s larger coolers into a compact premium package for space restricted systems. 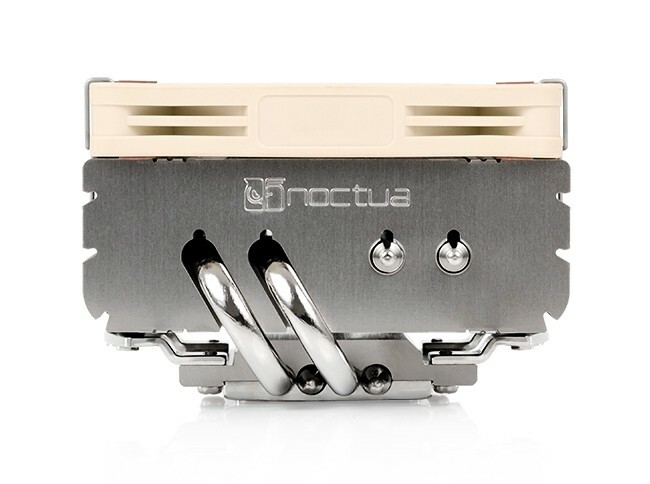 The new PWM version of the NF-A6x25 sports Noctua’s custom designed NE-FD1 IC for fully automatic speed control via 4-pin fan headers and comes with a Low-Noise-Adaptor to reduce the maximum speed during PWM control from 3000 to 2300rpm. 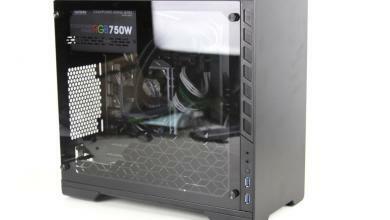 Its superb running smoothness, SSO2 bearing and Noctua’s trusted premium quality make it an elite 60mm choice for the highest demands. 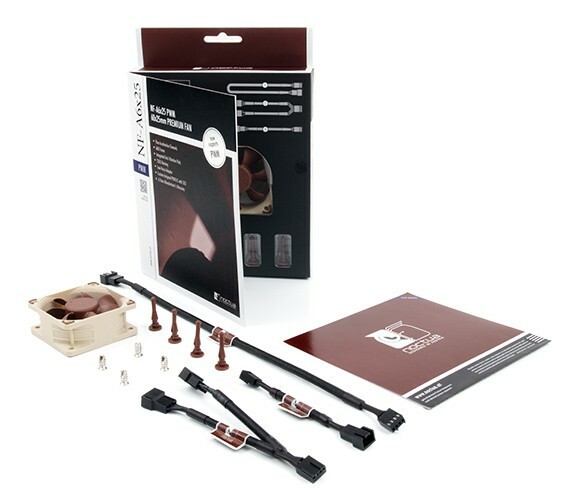 Designed in Austria, Noctua’s premium cooling components are internationally renowned for their superb quietness, exceptional performance and thoroughgoing quality. 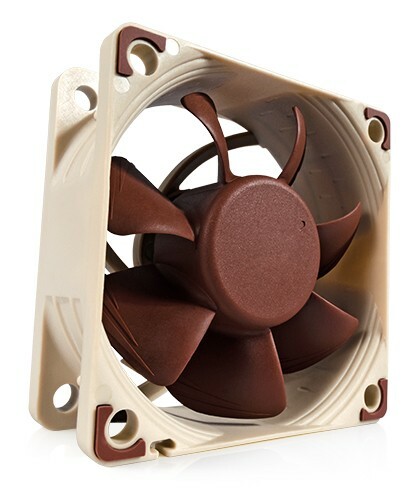 Having received more than 3000 awards and recommendations from leading hardware websites and magazines, Noctua’s fans and heatsinks are chosen by more than a hundred thousand satisfied customers around the globe.